If you think oatmeal is dandy on your breakfast table, just wait until you see what it can do on your skin. Oatmeal ranks as one of the most versatile and beneficial natural products for skin care, thanks to its beefy list of advantageous properties. Opt for an organic oatmeal facial mask that includes milk and honey and you can triple the goodness your skin will readily absorb and enjoy. water to create a paste of your desired consistency. Use it as a cleanser by applying it to your face in gentle circular motions and then rinsing with a burst of cool water. Use it as a refining and nourishing face mask by generously slathering your skin with the paste then rinsing after several minutes. You can mix up the effects and add to the benefits by substituting the water with aloe vera juice, yogurt or another wholesome option. 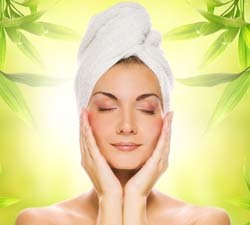 Oatmeal: Oatmeal’s benefits kick off with its ability to soothe and moisturize. Not only can it reduce the inflammation and itchiness of conditions like poison ivy and sunburn, but it can act as a gentle balm to calm a wide range of skin irritants. Dull and flaky skin can become fresh and vibrant if you use an oatmeal mask for dry skin, with The Daily Green reporting on oatmeal’s ability to rejuvenate, revitalize and soften. Oatmeal also works well for opening the skin pores, which allows for a deep yet gentle cleaning that allows your skin to shimmer and breathe. Honey: Honey can be super-sweet for facial skin care products due its antiseptic and protective qualities. Not only does it have a long history for treating wounds, but it is also racking up quite a reputation for treating acne and dry skin conditions. Honey can also help reduce eye puffiness and work as an exfoliate to gently slough off dead skin cells, dermatologist Dr. Doris Day told CNN. Milk: Milk also works as a skin-friendly exfoliate thanks to its lactic acid. Lactic acid gives your skin’s overall texture a boost by removing the dead cells, moisturizing the existing cells and encouraging collagen growth for new cells. This process helps reduce wrinkles, fine lines and acne scars while evening out your skin tone. Unlike facial skin care products that contain additives or harsh chemicals that can actually harm your skin, an organic oatmeal face mask contains oatmeal that was grown and processed using natural methods. The healthiest skin products will contain organic versions of other ingredients, such as milk in the form of organic buttermilk and honey that is both organic and raw. Additional beneficial ingredients in a high quality facial mask can include almonds and almond oil, citrus acid and the skin-soothing Vitamin E.